This friendly dolphin just wanted a cuddle. This is the heartwarming moment a dolphin enjoys a belly-rub from an obliging snorkeler. 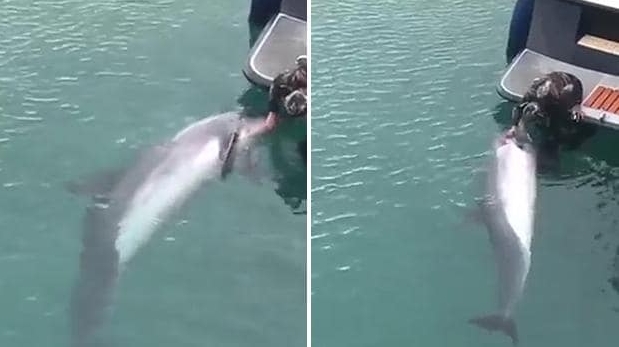 Rare footage shows the bottle-nose dolphin - called Dusty - rolling over in the water as a woman on a boat gently pats her. It was filmed by nature photographer Elaine Farrell in Inis Oirr, the smallest of the Aran Islands in western Ireland while she was waiting for a ferry. Ms Farrell said the dolphin had been following the woman while she was snorkelling. Dr Simon Berrow, of the Irish Whale and Dolphin Group advised swimmers not to get too close to the animals if they can avoid it. Responses to "Heartwarming moment a dolphin enjoys a belly-rub from a nature photographer"